This is a collection of some of our Math products that you can download. 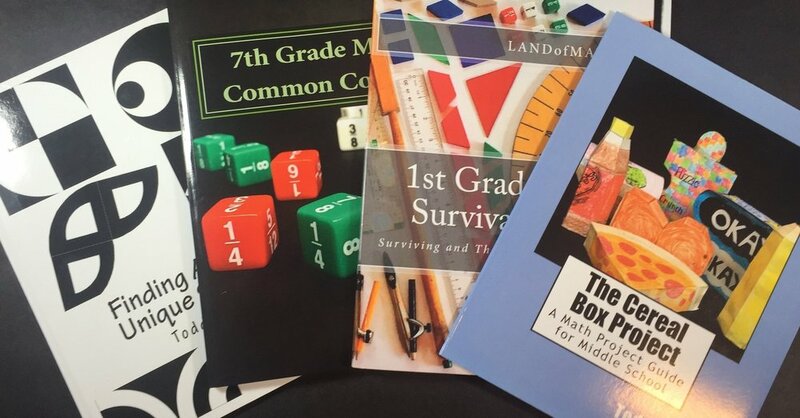 This includes five of our most popular math books: 7th grade math common core 24, The math cereal box project, Finding the area of Unique Shapes, the Ultimate Percentage Guide, and the First Grade Math Survival Guide. In addition to the books, there are also downloadable math puzzles and math worksheets. Some of these topics include: Percentages, Box and Whisker Graphs, area of circles, Area of triangles, Area of Trapezoids, Equivalent Expressions, and two step equations with tape diagrams. This is a collection of different math products you can download. Books are available on Amazon (Tab at the top of the page). This is a collection of 5 different activities using percentages to solve problems about tips. Students will need to (1) Find the amount of tip, (2) Find the cost with tip, and (3) Find the original price when the final price and tip are known. - One: "Percentage Word Scramble"
This is a review game that students really enjoy. We usually use small groups with this activity. Students are given a sheet with 12 problems and the numbers 3, 2, & 1 in each grid. Students can solve problems in any order they choose. The first group to get a correct answer for a problem gets 3 points, second gets 2 points, and third gets 1. Students can select any question and up to three different teams can get points on each question. This allows all teams to have numerous chances to get points. The Percentage Word Scramble is a collection of 15 questions. As students answer a question they look for the matching answer above. Each correct answer matches a letter. Once all the questions have been answered students will unscramble all the selected letters to spell out two different words. Nothing we like more than hands on activities. There are two puzzles included. One puzzle has triangle shaped puzzle pieces and the other puzzle has octagon shaped puzzle pieces. It's a great way to practice percentage problems. It is also a tremendous way for students to problem solve when they have a puzzle piece out of place.